The Imperial Palaces of the Ming and Qing Dynasties in Beijing and Shenyang with their grand palatial architecture represent the Chinese civilisation at the time of the Ming and Qing dynasties. 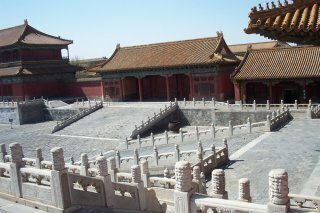 The Imperial Palace of the Ming Dynasty lies in Beijing, and is now commonly known as the Forbidden City because the general public had no access to it. 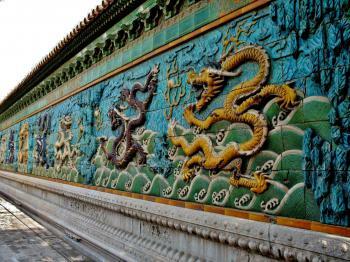 When the capital of the Ming Empire was moved to Beijing in 1421, the emperors took up residence in the Imperial Palace. It was not meant to be a home for a mortal king but for the Son of Heaven. The exact, grid-like geometric pattern of the complex reflects the strongly hierarchical structural of imperial Chinese society. The Imperial Palace of the Qing Dynasty in Shenyang is a smaller complex dating from the 17th century. 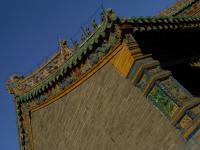 Its architecture shows Manchurian influences. 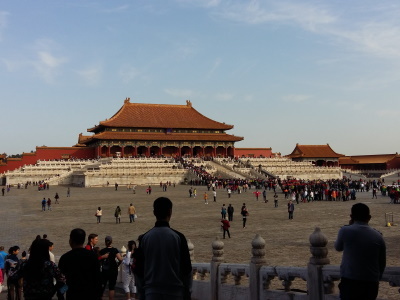 The Forbidden City is a huge complex at the center of Beijing (behind the Tiananmen gate), that nowadays attracts thousands of visitors every day. I entered from the North, so I was met with innumerable (mainly Chinese) groups that had started from the main entrance in the South. The funny thing is that everybody clings to the main path (the North-South axis), and that 10 meters to the right or left you're almost on your own. The complex is surely meant to impress: everything is just huge. You have to take your time to find and look at the details. What I liked most where its simple but effective colours: bright red walls, with green and yellow accents in the tiles. I visited this WHS in October 2013. First I visited Tiananmen Tower, then I proceeded to the Forbidden City proper. The different halls are beautiful and the whole place is amazingly huge. Crowds of tourists and locals visit, yet if you walk just a few steps from the centre path of this site you can still enjoy it at your own pace. The seven bridges are intricately carved and the palace reflecting in the water was the highlight of my visit. I also liked the colorful pavilions in the park just opposite the exit of the imperial palace. 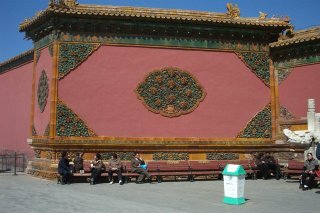 I visited the Imperial Palace in Beijing twice. Once in 2006 and once in 2007. A true exploration of the site runs about half a day. It is worthwile to explore the side sections of the palace. Each side passage or courtyard reveals something new and is quite interesting to search in depth. Moreover, large restored sections of the palace are being opened every couple years. Suprisingly, vast sections of the palace are still closed and are scheduled to be revealed to the public in the not too distant future. Try not to visit the palace in the summer or weekend if possible as it gets clogged with people (literally). The tile panels are certainly a highlight, and side alleys have a more personal atmosphere that you don't find walking near or around the central axis. I prefer weekday mornings, if you are lucky with the smog, the pictures can be incredible. I must admit I wasn't especially looking forward to this visit; it had more of a feeling of something I should do rather than wanted to do. However after a few hours of strolling around the Forbidden City I was happy that I had seen it and ducking off to the sides could make it a surprisingly quiet experience even on a weekend afternoon. The sheer size of the first part of the palace is what really grabs you, as Ben has stated below it takes a massive site to be able to swallow these large crowds and it certainly did that, it would be odd to see such large spaces with only a small amount of people in them. The main temples and pavilions really were impressive and I spent a fair bit of time just taking in their wonderful architecture and paintings. After the grand ceremonial buildings at the front the rear of the palace is a series of interlocking courtyards and private palace quarters which were reasonably interesting, however the crowds felt a little denser here and I started to wane a little so decided to head on out before palace fatigue really set in. I enjoyed my visit here more than I thought I would and the grand ceremonial parts of the complex allow you to get a sense of the awesome scale of the place as well as a chance to escape the crowds. The Shenyang Imperial Palace may not be as grand as its Beijing counterpart; however, what makes up for its size is the intricate design of the buildings. The Manchu style of architecture is not like any other seen in most temples or buildings in China. I stayed in Shenyang for two days and got to visit the other two Qing dynasty tombs in the city - Zhaoling and Fuling. 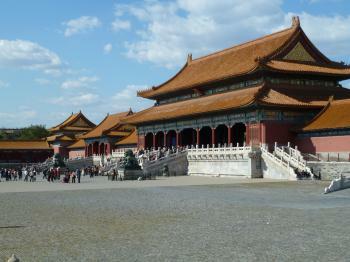 I took an entire day to visit the Imperial Palace in Beijing, popularly known as The Forbidden City. It is a central enclave facing Tiananmen Square. I first walked the South - North axis, and then returned to see the Seven Dragons Wall, Archery Pavilion, East Palaces and West Palaces in the Imperial Gardens. The scale and the artistry, as well as the strange names of the pavilions, halls, gardens and monuments were fascinating. I went this Palace in a tour group. Due to time constraints, we were made to walk from the "Wu Men" (front) all the way to the back. One straight path passing all the main palaces. Do not forget to visit some of the palaces at sides. These are hidden treasures with less tourists and more intrigue. Certain smaller palaces even house artefacts etc. Also, do not forget to climb the hill "Jing Shan" (create from the earth excavated from the construction of the palace) at the back of the palace compounds. This will offer you a breathtaking view of the whole palace compound. Definitely worthwhile spending more time exploring the entire compound!!! 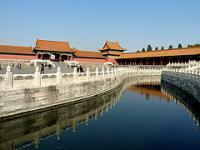 The Forbidden City may be the largest palace in East Asia. However, many treasury are stored in the Imperial Palace Museum in Taiwan. The former government moved the treasury to Taiwan before turnover to Communists in 1949. Therefore, tourists visit the architechture of the palace mainly. The Forbidden City is possibly the most packed tourist attraction I've ever visited. Thankfully, it is still well worth the visit. The sheer scale and opulence of the place it quite astonishing. From "Imperial Palace of the Ming and Qing Dynasties, China" to "Imperial Palaces of the Ming and Qing Dynasties in Beijing and Shenyang"
Glazed tiles: Beijing Imperial palace for its yellow glazed tiles. Forbidden City: "Forbidden" (in Beijing's Forbidden City or Imperial Palace), referred to the fact that no-one could enter or leave the palace without the emperor's permission. Drifting Across the Sea: A Record of Ming China: 20th Day, Fourth Month. Acknowledging Graciousness in the Palace. This day was cloudy. "The outer gates of the Imperial City had already been unlocked, and the ministers of daily attendance were entering in order. Compelled by the circumstances, I put on festive dress and entered the palace. Troops were drawn up smartly, lights burned brightly. Li Hsiang seated me in the central courtyard. Soon, drums were beaten at the left end of Wu Gate and bells struck at the right end. Three arched gates opened, and at each gate two big elephants stood on guard, their forms spectacular. Just before daylight, the officials of the Court lined up by ranks in front of the gate. Li Hsiang led me to my place in the Court ranks and then led Chong Po and the others to form a separate group. After the five genuflections with three kowtows each, we went through Tuan Gate and passed through the Gate of Cheng-tian, which was inside Ta-ming Gate. We went to the east, passing out though Chang-an Gate again, and I put back on my mourning clothes. We passed Chang-an Street and returned to Jade River House." 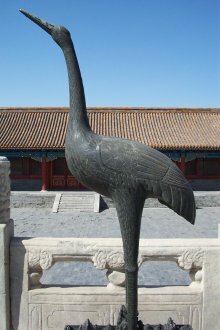 Taoism: There are Taoist shrines in the Forbidden City. Shamanism: The Kunning Palace was used for Shaman rituals during the Qing Dynasty. In Video Games: China: The Forbidden City - The game is set in 1775 in the Forbidden City. 434 Community Members have visited.